Decades of experience make Minco much more than a components supplier. 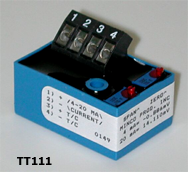 Minco has been designing and manufacturing critical instrumentation components since 1956. Their engineering and manufacturing plants employee over 1000 people worldwide. Minco instruments are made for easy and straight forward installation, and can be specially calibrated for improved system accuracy, even over long distances. 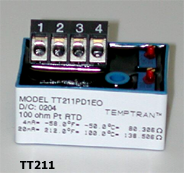 Temptran™ transmitters amplify the low-level signals from RTD's or thermocouples to an industry standard 4 to 20 mA current signal proportional to temperature. 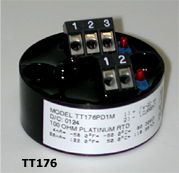 Unlike resistance or voltage, current signals are immune to resistance in extension wires and stray electrical noise. This lets you receive accurate signals from a sensor located thousands of feet away. The 4 to 20 mA output signal and DC power share the same wire pair. You don't need to run power wires to every sensor location. RTD transmitters also linearize the signal to temperature, making them excellent low cost signal conditioners.